Our addiction to cheap, fast fashion is costing the Earth. I confess that I have never previously been in a Zara store. When I walked through the doors of one, I thought of the words of a Puma corporate social responsibility man when I said to him that I didn’t really understand sportswear, at the UN climate talks in Katowice. “You’re not our target audience,” he said, looking me up and down, not unkindly. I’m clearly not Zara’s target audience. But I was there for a purpose other than shopping: for research. I’d read about a test conducted on a Zara blouse that after a few washes had essentially dissolved. That such a thing should exist didn’t surprise me: I’m well aware of the figures that we’re now buying twice as many clothes as we were a decade ago, that fashion is essentially being treated as a throw-away item, and that ranges no longer run in seasons, but weeks. But I was trying to imagine what such a garment looked like. I didn’t have to look hard. 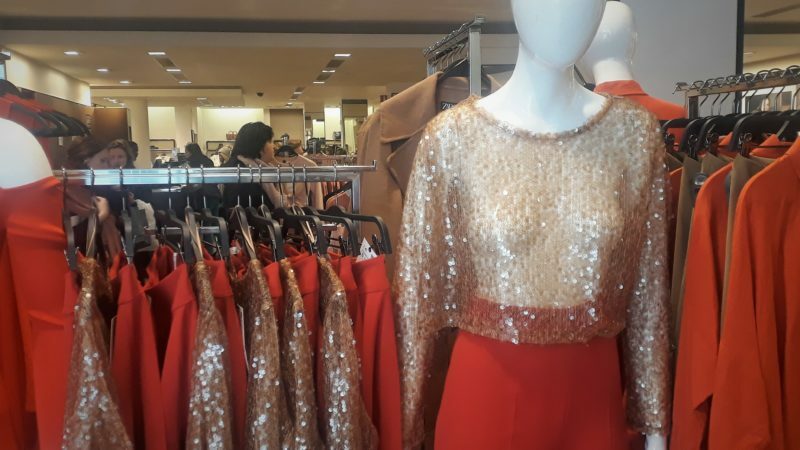 Just inside the door was a transparent top, covered with gold-coloured sequins. To describe it as flimsy really doesn’t cover it; it looks like it is falling apart on the hanger, and the sequins catch on each other and the fabric, tearing each time the fabric moved. It is very hard to imagine this garment being worn more than once – certainly to imagine it being washed and worn again. But I’m not particularly targeting this specific brand here – there’s clearly a whole class of stores producing such garments. And I’m also very much not targeting the shoppers. Many people – perhaps facing an interview for a desperately needed job and with only pennies in their pocket – are buying here because they have no practical alternative. If you need a white top to go under a work jacket, this may well be the cheapest place, and if it only lasts a few washes, well what matters now is getting the job. Many too have been taught to regard fashion shopping as therapy, bombarded with billboards and internet adverts created by clever minds with no expense spared, indicating that the solution to their misery is a new dress. Others have been so ill-prepared for life by an education system focused on exams that they can think of no entertainment beyond shopping. I think back to a former role as a boss, gently seeking to counsel a staff member always in debt, and always appearing back from lunch with more clothes. I suggested she find some other entertainment. She genuinely was unable to imagine any other way to spend “free” time. Yet this addiction to fashion consumption comes at the price of the planet. The climate emissions of the fashion industry came under significant attention for the first time at the United Nations Climate Change Conference in Katowice last year. That was progress of a sort, although the focus was entirely on efficiency savings – not on producing less. If we wore our clothes for twice as long – if they were made to last twice longer – then we’d halve the fashion industry’s carbon emissions. But the issues isn’t just climate change, as huge and pressing as that is. Some 60% of new fabric in the world is made from artificial fibres. That dissolving blouse wasn’t just wasting all of the energy (and human labour) that went into it, it was producing a flood of plastic microfibres to pollute our world – microfibres that are found everywhere now on this planet, and are certainly having impacts on our and nature’s health. The Women’s Institute deserves credit for leading on this issue, with its End Plastic Soup campaign. Even that campaign however, like the industry – as the Puma executive conveyed to me – is largely focused on trying to catch the fibres before they’re freed into the environment. Yet they’re freed every time the wearer moves or brushes against an object, something the National Trust, in its search for a non-polluting fleece, has acknowledged. Yet replacing artificial with natural is no answer. Cotton and wool have massive environmental impacts – even the less damaging organic options – and though when I raise this issue someone will always suggest hemp (which is indeed a good solution) we cannot blanket our farmland with it. We need to produce a far lower volume of clothes. Cutting by 50% wouldn’t be hard – after all, that’s just taking us back in Britain to 2008 levels. And I don’t recall anyone walking around in rags then. I haven’t even yet reached a further massive issue for the industry – its social impact. I was looking in the London Tube at an advert for Boohoo, a fashion website, for a delicate-looking t-shirt closed by a web of narrow straps. I’m no seamstress, but I’m sure this takes real skill to construct. It was being sold for £6. How much, I wondered, could the skilled seamstress who made that garment have been paid? Clearly not enough. Ranaa Plaza is ancient history now for students in school, yet there’s scant evidence that much has really changed. This is an industry whose profits are built on the blood, sweat and tears, and all too often deaths, of young women and girls around the world. It’s also built on the misery of underpaid, zero-hours contracts in high street stores across the UK. It is an industry that on every level if built on exploitation and destruction. Yet it clearly won’t change through wishing. Massive profits are being made by the likes of Sir Philip Green, as we all bear the environmental and social costs. They won’t give it up without a fight. A recent House of Commons committee report made a small start in identifying the problem. But their suggested solutions were derisorily small. The real cost of every T-shirt has to be on the tag – with companies paying for the real costs they are imposing on all of us. But that also means that everyone facing that important job interview can afford to pay the real price. You start with as dissolving blouse, but end with the need for social, economic and environmental transformation. This reflects a talk about the need for system change given with Agile Rabbit in Exeter.